The New Snuggle Nest Surround XL is designed to offer a greater sense of security for newborns when co-sleeping with parents. The new extended length and slightly narrowed foot area offers a comfortable space for your baby, and a sleeker profile in the adult bed. The Snuggle Nest Surround XL is comprised of two rigid, vented wall units at each end, which help to block adult bedding and create an exclusive sleeping area for baby. Two flexible side panels built into the soft quilted cover, are filled with thick structural mesh, and allow easy and comfortable access to baby, while forming an air barrier from adult bodies and bedding. Also included are a firm mattress with a wraparound sheet and optional 1.5” incline wedge. By placing the Snuggle Nest against the headboard of the adult bed, infants are more removed from the “rollover zone’ and bedding. For additional comfort and soothing, a Sound & Light unit is included, featuring music and familiar womb sounds, as well as a soft light for nighttime checks on baby. The Snuggle Nest folds quickly and compactly for handy portability for parents on the go. Not for use in cribs or bassinets. Creates separate sleeping space for co-sleeping babies in the adult bed and also for use as a travel bed or daytime napper. Two rigid, vented wall units help serve as a barrier between baby and adult bedding and rollover. 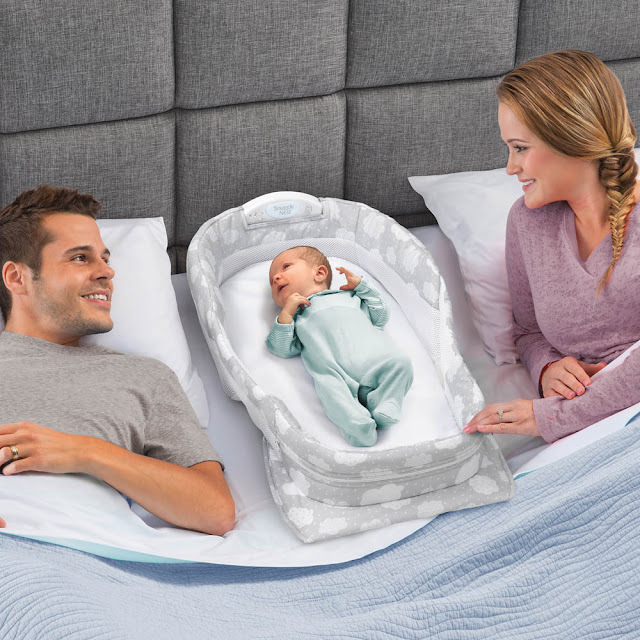 Flexible side panels provide comfortable access to your baby and are filled with a 1” thick structural mesh to create an air barrier between baby and adult bedding. Quilted fashion cover, with airy mesh inlay along the interior perimeter, helps improve baby’s breathing space. Waterproof foam mattress with wraparound sheet. 1.5” molded Incline Wedge for optional use. Soothing Sounds & Light unit featuring Brahms's Lullaby and womb sounds to lull your baby to sleep. 5-level volume control and automatic shut-off allows the perfect setting for your baby’s comfort. Folds easily and compactly for travel. Janessa from Thrifty Nifty Mommy is expecting her 4th baby and recently blogged about her thoughts on the Baby Delight Snuggle Nest Surround XL. Make sure you check out what she had to say! 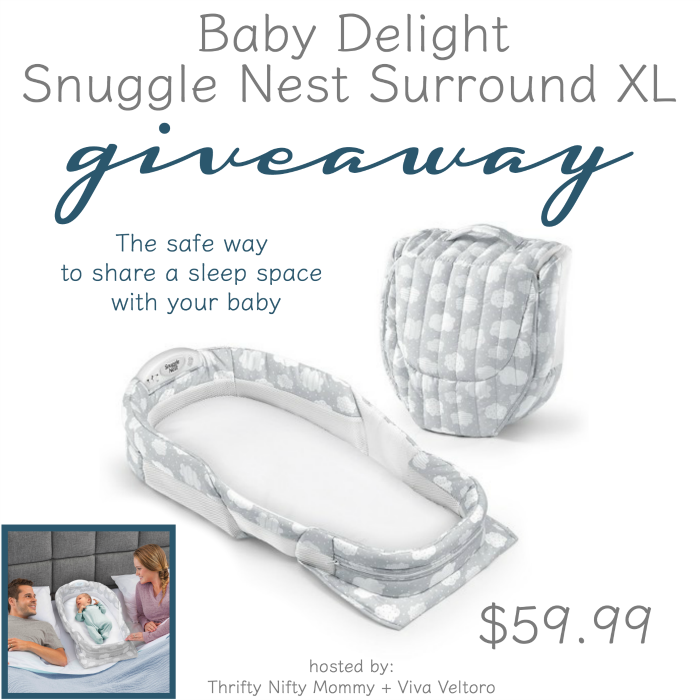 One person is going to WIN a Snuggle Nest Surround XL, ARV $59.99! Open to the Continental US only, ages 18 and up. Ends 12/28/15 at 11:59 PM ET. Enter using the Giveaway Tools form below. Good Luck! Disclosure: This giveaway is sponsored by Baby Delight. Viva Veltoro, Thrifty Nifty Mommy, and the participating blogs are not responsible for prize fulfillment.One winner will be randomly selected using the Giveaway Tools random selector and notified via email. Once notified, the winner will have 48 hours to respond or a new winner will be chosen. This giveaway is in no way associated with Facebook, Twitter, Instagram, Pinterest or Google. Void where prohibited. Silver Clouds is my favorite print! My favorite print is the taupe leaves, I think it's really pretty. Thank you.